Alteryx is surely the king of easy-to-use data manipulation tools, and as a bonus handles predictive and spatial analysis via a very friendly set of tools. One method by which it makes things easy to use is that it has a huge array of built-in tools to drag and drop, thus saving you the task of programming procedures yourself. This means each tool is easy to use for the desired purpose, but has a downside in that one has to actually locate the tool one wants, when there are probably over a hundred to choose from (I haven’t counted, and besides, you can add more if you wish). There’s a thin list of tool categories (In/out, Preparation etc.) and then, within each category, a larger list of actual tools (Browse, Date Time Now etc.). The list is so long it cannot fit on one screen, even on a reasonable widescreen monitor. I understand that the programmers behind Alteryx are already considering improvements to this interface in order to make it easier to find what you need in a hurry, but there are already a few ways that – whilst not life-changing – may help you save a couple of seconds of looking for the correct tool many times a day. You see on the top left of the above screenshot that there’s a search box. If you know the tool you are after, just type its name in here and the tools list will instantly filter down to those that match what you typed. In fact, it’s cleverer than it seems. Tools will pop up even if the name doesn’t match as long as Alteryx thinks it “sort of” relates to what you type. This means, on a good day, it’s also a quick way to find a tool you might have forgotten the name of. For example, perhaps you need to create what Excel would call a pivot table. There’s no tool called “pivot” in default Alteryx, so what to do? Just type “pivot” into the tool search box and it shows you 3 tools it thinks might relate to pivoting – cross tab, transpose and table. Sure enough, it’s first suggestion of “cross tab” that you probably want to use. You’ve probably noticed already the “Favorites” tool category. This contains a few tools aggregated from other tool sections. The defaults aren’t bad, but perhaps you want to change them to fit your personal workflow. 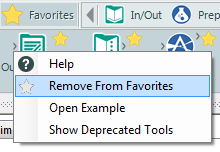 It’s as simple as right-click -> remove from favorites once you’re in the favorites section to get rid of one you don’t want (but keep it in its main category section), and right-click -> add to favorites from any of the non-favorite tool categories to add the tool you clicked on to your favourites. In this way you can construct your own custom ribbon that contains the tools you use most often, no matter from which section they come from. For those who are not fans of the right-click, if you hover over any of the tools in the other sections, you will see a faint star appear to the top right of the tool. Clicking on that will also add the tool to your favourites section. You see the icons showing the tool sections available to you on the upper thin ribbon? They’re more than just a way to open a tool category. Note how each one is labelled with all the icon of one of the tools within the category. For example, the “Preparation” section is labelled with a formula-tool conical flask icon. You can actually drag the small icons down to your workflow and you’ll get the default option for that tool category in your workflow without having to change to its tool category first. 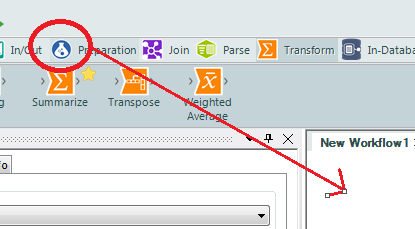 In the example here, clicking and dragging the Preparation category icon will give you a formula tool to use, without changing the select ribbon category away from “Transform”. But what if you don’t use the formula tool much and wish you can get to drag the Filter tool down without opening that tool’s section? Just right-click the Filter tool and click on “Set default tool”. You’ll notice the icon next to the “Preparation” category changes to resemble the filter tool’s icon – and now you can click and drag that into your workflow without changing away from another tool section. Perhaps you are less bothered about individual tools, but more bothered by categories as a whole. By default some of the categories are off the right-hand of the screen unless you have a giant monitor. You might be frustrated if you’re a constant “Social Media Tools” category user when you find you have to constantly scroll right to find the category every time you wish to use it. You can however right-click on the category icon and choose “Pin Social Media” in this case. That will move it to the left and will keep in nice and handy next to your favourites category. When is it safe to stop watching the match? Despite the Harvard Business Review‘s insistence that data analyst is the sexiest job of the 21st century, ask a non-quant about popular references to data analyssis and you are quite likely to hear some reference to Moneyball (be that book or film). Spoiler alert: “sabermetric” data analysis enabled a baseball team with less money to beat another one that had a lot more money. Very cool, except – in possibly the most inflammatory statement likely to make it onto this blog – in general watching team sport matches at length is pretty pointless. Evidence? Clauset et al. have contributed to the field in their recent paper “Safe leads and lead changes in competitive team sports”, published recently in the Physical Review journal. Within it, they attempt to use data to model and validate how the lead changes between teams playing certain sports. For instance, team A might score the first point in a match, but – specific-sport-allowing – team B might well then score 2 points and seize the lead. The usual rule of course is whoever happens to have the lead after a set amount of time is deemed the winner. Although they dabble quite successfully in others, the sport they model most accurately is basketball. Their rationale for starting here is that basketball has a high rate of points scoring, with NBA statistics showing an average of 93.6 baskets with an average value of 2.07 points per basket. Modelling frequent events accurately is almost always easier than modelling infrequent events, so it’s clear why they picked basketball over UK football for instance, where FiveThirtyEight reports that the most common score found in almost 200,000 English football games was a thrilling 1:0. This occurred in about 16% of the matches. In fact not far off 10% of games ended with no-one scoring and no-one winning at all, just to make it sound even more exciting. Anyway, that aside, how did Clauset’s team model the changes in lead of basketball so accurately that it significantly beat previous heuristics? Advanced logistic neural network forest tree linear super-regressions? Nope, they used a random walk. For those unfamiliar with random walk models, it’s quite easy to understand at least at the simplest level. You can imagine a random walk in physical terms. Consider a situation where you’re standing on a platform and can walk either forwards or backwards. Flip a coin – heads you walk forwards, tails you walk backwards. Repeat until 48 minutes have elapsed and consider that your result. Sounds fantastically trivial, right? What in the uber-complexities of reality could really be modelled by anything derived from such a basic process? Oh, nothing much, just simple things like the stock market and molecular movements amongst others. A model based on random walks provides a remarkably good description for the dynamics of scoring in competitive team sports. In fact the same set of laws can determine many aspects of having the lead in a game. The model even covers the empirical fact that if something exciting is going to happen (an “extremal value”) then it tends to be near the very start or the very end of the game. Cynically, our results suggest that one should watch only the first few and last few minutes of a professional basketball game; the rest of the game is as predictable as watching repeated coin tossings. And I don’t think they mean that in a positive way! For the full formulae, validation and so on, see the original paper. But being in the middle of an arena-crowd watching said sport is probably not an ideal time to whip out the scientific calculator to determine if the lead will change and when – so there is a handy rule of thumb one can use to determine if the match is effectively over, as Slate reports. 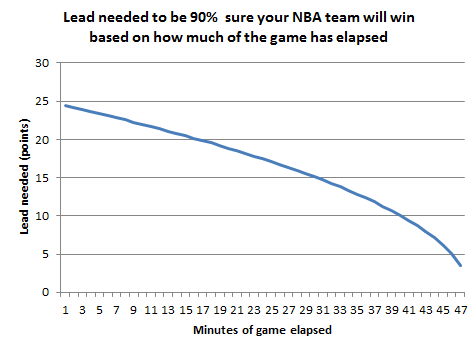 As even the most ardent fan is unlikely to think in terms of seconds remaining, the below chart will tell you when it’s safe to make your excuses and leave the NBA stadium, assuming a 90% confidence level is within your tolerance. Assuming a standard 48 minute basketball match, locate the number of minutes that have elapsed already on the x axis, and if the current winning team is leading by at least the y-axis number of points then they are at least 90% sure to win overall. For instance, if you’ve watched 40 minutes of play, and your team is ahead by around 10 points then there’s really not much point in watching it play out – go flip some real coins at the bartender whilst there’s not a queue.